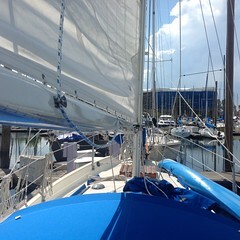 We had a fabulous sail down the coast. The absolutely perfect wind and sea state for Konami’s blue and red fancy soft sail – the drifter. 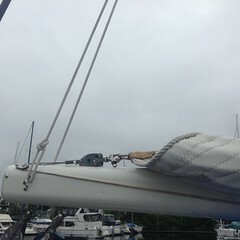 15.5 hours of great sailing, no pole, just flying it off to port with full mainsail. Averaging 5.5 kts, WNW winds were perfect but drove us a further offshore, by nightfall the winds died. Warm winds, beautiful sunny skies, clean air at last, we were in heaven. This is what we had dreamed of, sailing a long passage on one tack with the free flying drifter. Glorious! Unfortunately on Friday evening we became ill with a flu bug, the usual achey flu symptoms left us both unable to function on deck. John dropped all sails, started the engine and hooked up Aimee, our good little Autopilot, swung the radar and chartplotter down into the cabin and we took turns checking on the course and traffic from the cabin bed. Of course John forgot the plank at home or I would’ve gladly walked it that night! 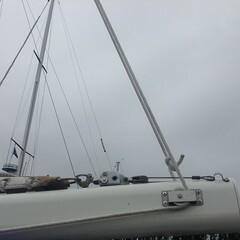 Saturday we still weren’t functioning and maintained boat course and traffic watches from bed, at least I no longer had to hug the boomgallow stanchion with my head hung over the side of the boat. We arrived Saturday just as the sun set, dropped anchor in beautiful sparkling blue water, the air was dry with a gentle cooling breeze coming off the rugged mountains. We managed to do a quick cockpit shower, ate some plain rice and went to bed. It was 7:00 p.m., we woke up 12 hours later. 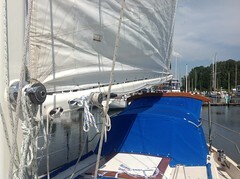 Motor hours: 40 (more than we wanted) Sailing hours: 15.5 Total distance: 265 nautical miles. Our buddy boats Anjuli and Yare showed up today. They had traveled on the inside of Isla Cedros, having done an overnight anchor there. Anjuli reported they hooked a lobster pot line, Dan ended up going into the water to unfoul the prop. Lucky break they had no damage, only an hour in the water to get free. They caught a large dorado, similar to Mahi Mahi and gave us a large chunk of it. Fantastic fresh fish for dinner and Pabst Blue Ribbon beer. Dolphins swimming circles around the boat, oh we’re living the good life! We departed San Diego Nov 14th, made the 4:00 a.m. departure for a 12 hour run to Ensanada, Mexico with our buddy boat, Anjuli. Calm seas with no wind made for a noisy ride, boring ride. The entry into the harbor and docking was one of the easiest entrances. Short and sweet. 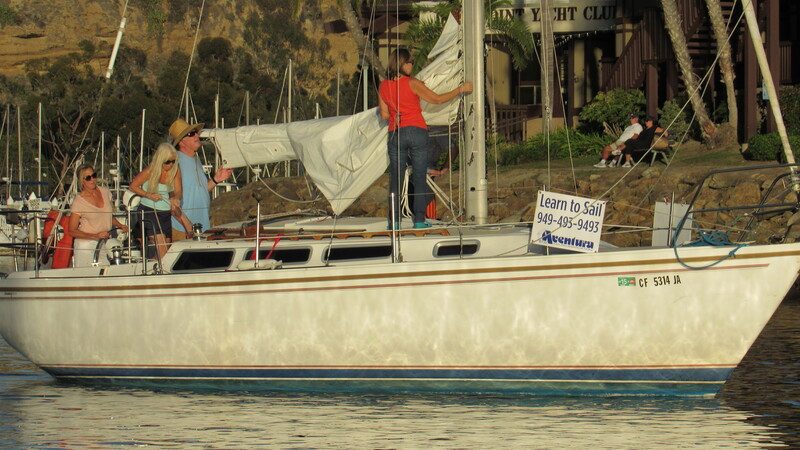 Another sailboat from Seattle, Yare, whom we met in Dana Point and anchored with in San Diego was already here. This is the buddy boat group. Dan and Tammy on SV Anjuli, Portland, OR; and Tor and Jessica with twin sons on SV Yare, Seattle, WA. The Customs and Immigration office was closed for the weekend and Monday was a national holiday so we spent 2 days confined to the dock area. Once we made the wifi connection we spent quite a bit of time printing out our documents and other information for the Mexican check in. SV Yare gave us detailed information on the check in process, told us what to expect, that was a great help. Tuesday at 8:00 a.m, we headed up to the marina office and they provided assistance with some of the Immigration paperwork, gave us a map and explained the lengthy process we would be facing. We walked about a mile to the CIS building, somewhat anxious that Customs would want to inspect the boat for contraband, agricultural bans, and excess alcohol. Not that we had the first two items to be concerned with, but the hassle of having our home turned upside down was a dreadful feeling. Fortunately, we were one of the first people in line so the CIS employees were courteous but very solemn. It took us nearly an hour going from one counter to another, back to the line for payment receipts, back to the Port Captain, back to the counter for additional payment receipts, get into the Customs window line, go back into the bank line and pay again. Final stamp of entry of boat and crew done. On to the next window for our fishing license. Filled out the information on a scrap piece of paper, ordered to go pay and bring back the receipt, the sigh of relief when the Wildlife Agent handed us our licenses. About 1.5 hrs later we were done! No inspections, no worry about declaring excess alcohol. By the time we left, the small office area was packed with tourists who had also been waiting to check in from a three day weekend. Back to the boat to have a beer, after all it was 10:30 and we had just completed a day’s work. We’re officially in Mexico where it’s sunny and warm, delicious Ceviche was on the lunch menu! We’re very sore from hauling groceries today. We’ve been hauling groceries for miles since Dana Point, especially in San Diego, but the streets here are partially broken up, pot holes that you have to step over and around, and large chunks of concrete missing from the sidewalks, it’s definitely not easy walking! We had 100 gallons of water delivered to the boat, and they funneled it in through the deck fills for us. $20 for purified water, we’re pleased! Diesel on the other hand will be labor intensive. We (John) has to carry the (2) five gallon jugs just over a mile each way as there isn’t a fuel dock in the harbor for small boats. Good bye to motoring up to the pump, hello shoulder straps. Actually, we’re hoping to borrow the marina’s dock carts and push those down the street. Just for entertainment, I’ll take the camera along. We plan to depart early Thursday morning, anticipating a 3 day, light winds passage to Bahia Tortuga (Turtle Bay), about 260 miles from Ensanada. 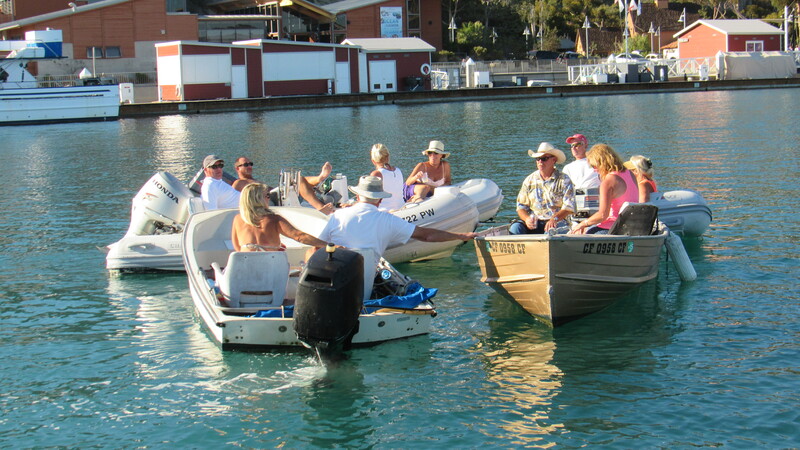 We plan to meet up with our buddy boats there and compare passage notes for the next leg down the Baja coast. Wish us great sailing winds! Weather Check: Forecast is good for today, some swells, currently no wind. Departing Dana Point. 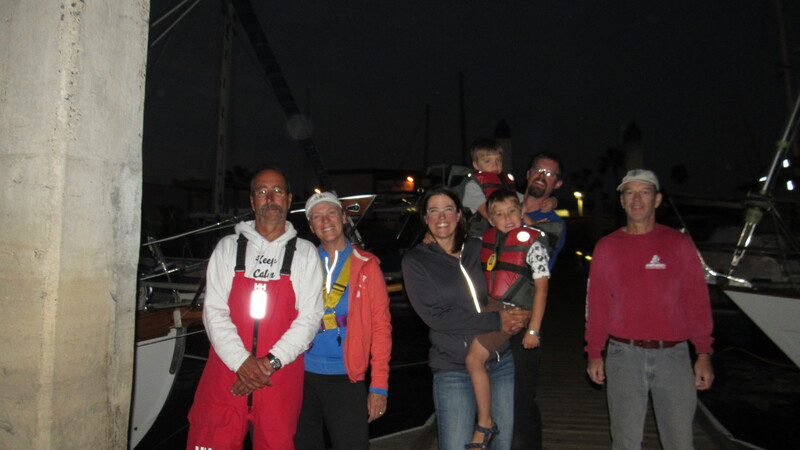 3:30 a.m., anticipated 10 hour run, 55 NM to Point Loma, San Diego Channel entrance. Checklist before starting engine: Lines (ropes) in the water, everything secured on deck, close all seacocks, Dog down (tighten) decktop, port and starboard hatches, PFDs and tethers, personal items: meds, water, gloves, glasses, clean shirts and pants. Start Engine: Check for raw water output, oil pressure, temp, RPMs, all check. Navigation: Radios on – channel 16 (USCG is on), navigation and running lights, chartplotter indicating AIS (ship traffic) targets, Radar on – 8 nautical mile scan, spun up and transmitting – check. Radar displaying all land and obstructions. I sent a quick text to our family with our intentions and joked about the US Navy watching for sailing terrorists. Our departure from Dana Point was great, boat and equipment running smoothly, alert crew fed and adrenaline pumping , we slowly headed out the short, well lit channel. Sailing vessel, Anjuli, our new friends we met back in Morro Bay was 2 miles ahead, just off to our starboard side according to the radar and chartplotter, we visually verified their running lights swaying across the ocean. The sky was very clear, the stars and planets were bright, even against the crescent moon. Jupiter was just left of Moon’s crescent, Mars and Venus were positioned under Jupiter. The seas were very rolly, large swells were coming in from the west and no wind. The large swells were left over from the front that has passed through the prior two days. Just 2 miles motoring out of the Dana Point channel, about 100 feet off port side, an 8′ tall mysterious cylindrical object appeared. It was about 8″ in diameter, with an odd base at the water line. It was grayish in color and absolutely stationary! WE NEARLY COLLIDED WITH IT! We simultaneously exclaimed, “WTF IS THAT!? !” GASP! My stomach had an instant pain, John went to neutral and started looking at the radar and chartplotter, I dropped down below to check the paper charts. How could we have missed a serious notation? Co-habitate, Co-dependent, Co-navigate, what were we missing? Is there any indication of reef, unlit buoys, fishing or other notations of possible obstructions? Unlit stationary buoys 2 miles from a busy, large harbor entrance isn’t likely, not in the US waters. We passed through this area 5 days prior when we arrived. There wasn’t a buoy in the daylight. Whatever it was, it barely showed up on the radar, AND, it wasn’t rolling and dipping with the swells. Four miles out, it disappeared from the radar screen. Just before the encounter, we heard a faint radio dialogue between the USCG and another vessel. The only piece we heard was “sorry, we cannot disclosed that information”. End of the dialogue. John believed it was a periscope, I had my doubts. We thought about contacting the USCG, but what could we say that would’ve sounded intelligent. “Uuh, we saw something in the water, not sure what it was – maybe looked like a periscope”. Nope, we weren’t about to broadcast that to the dark world. I had the jitters for quite a while, double checking the radar every couple of minutes. After arriving in San Diego, we asked Anjuli if they saw anything unusual in the area. We double checked the charts, the only notation we read was “Military Exercise Area, Mariners are cautioned against possible hazards due to military training activities”. 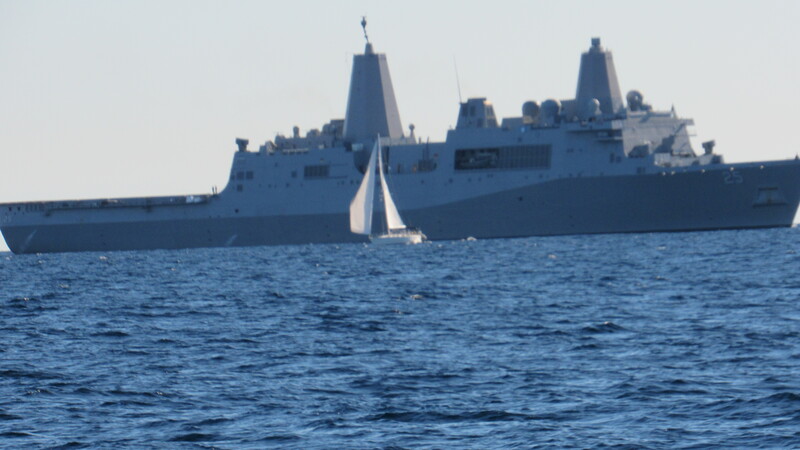 Yep, I now believe John was correct, and the US Navy IS watching for sailing terrorists. Here we are in Dana Point, south of Newport Beach, south of big L. A., Cal. 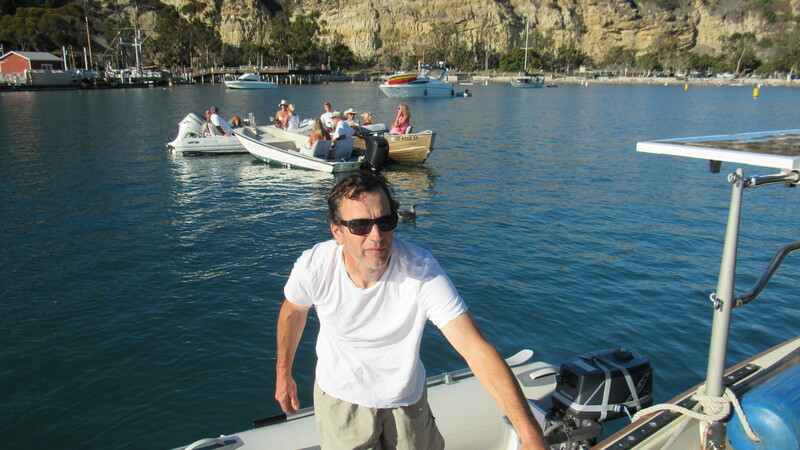 We motored for nearly 20 hours from Santa Barbara. The warm temp made it so we were down to T-shirts and shorts until midnight. Now this is cruising weather. A glassy smooth ocean and a windless night made the trip uneventful. The shooting stars were vivid, the half moon kept us company. The LA city lights lit up the sky and appeared as if dawn was breaking over the mountain range for miles before and after we passed by. The looming oil rigs 4 – 5 miles offshore were lit up like ginormous Christmas trees. No worry about collisions. Dana Point is an easy harbor to get into, easy fueling area, deep wide channel, and exotic looking. Nearly 2500 boat slips all crowded behind a long man-made breakwater. Homes valued in millions hang out over the high cliffs, the mountain ridge is filled with homes that were built in the 50’s when earthquake and zoning laws didn’t exist. Scary, and high insurance premiums, if that should make a difference. The high cliffs trap the warm air, right down to the harbor’s edge. People swarmed the beaches and harbor today. It was fascinating to watch and we have a new favorite past time. The people, the view, and the personalities that match the boats, we counted them from the anchorage. We watched a sailboat drift by, “Mermaid Trap”, we rolled our eyes, shook our heads and watched the lone male driver motor out to sea. Wonder if he went out on the ocean to look for Nemo too. “Pacifico” (the Mexican beer similar to Corona), a scruffy looking sailboat smoked heavily as it passed us, beer drinking couple of guys yuk-yucking in the cockpit. 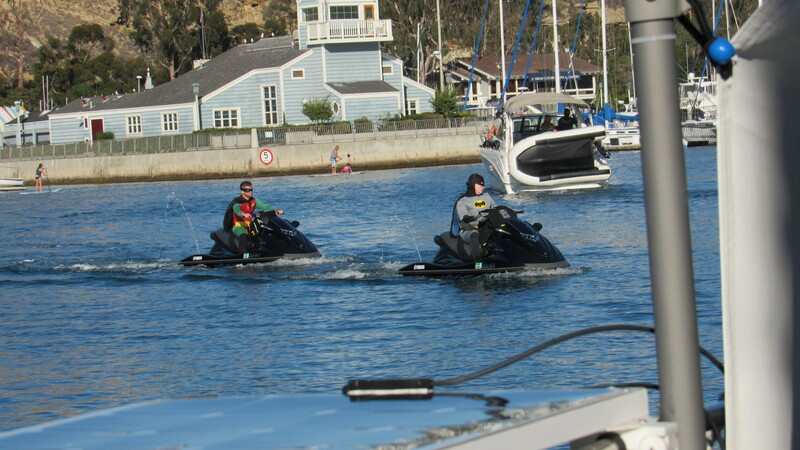 Batman and Robin zipped by on their water-batmobiles, fully dressed up and ready to “Ka-pow”, “blam” the drinking and driving crowd. BUII’s, just as serious as DUII’s. The stand up paddlers with their sea dogs, paddlers with kids – a fun family outing. A woman tried repeatedly to climb a rope ladder to get back into a little fishing boat named “Happy Hour Too”. I wanted to offer our ladder but it wouldn’t have fit the side of their boat. After 10 minutes of struggling and 2 people pulling her up, she made it in but not so gracefully, she didn’t match the boat name with her poor body sprawled across the transom and her bathing suit pushed up beyond her hips. A raft-up of 4 dinghies full of retired folks enjoying drinks and hooting at us asking if we came all the way from Portland just to get away from people. Ha ha, actually they were funny, especially the dinghy guy named “Longhorn” with a steer painted on the side. He must’ve come from Texas. Then watching the stand up paddler boarders and kayakers playing chicken with the incoming motorboats in the channel. On the rocks or bow adornment, flip a coin. As we sip more wine, oh what a kick watching the crazy water people. A whizzing, do-dah sailboat “Trident” with 3 men on board couldn’t wait for their turn to get around the corner, they passed another boater on the outside turn in the narrow inner channel. Keep that up and they will learn what Tri – Dent really means. Here comes “Cool Man, Cool?” sailing into the mooring area filled with paddlers and swimmers, hard over to skid around our anchored boat. Not so cool, idiot! He waved at us, I gave him the finger from my side view. 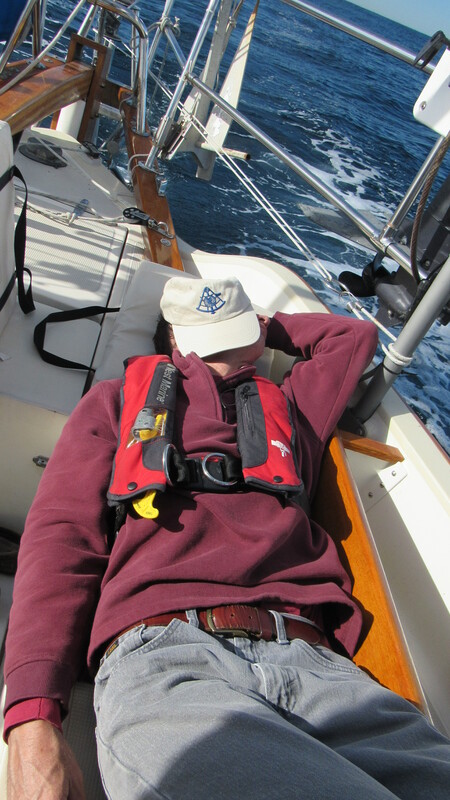 Sailing school, Rule #1 – Wear your PFD (personal flotation device). Guess the instructor forgot to read the rules. Oh, the Harbor Patrol comes around to check on boats overstaying the 5 day limit and for vagabonds, but ignores the boat with blaring music filled with foul-mouthed passengers. Thank goodness evening is nearing, they will leave. Aww, “Mermaid Trap” just motored back in, the sun is setting and he’s still alone, hmmm. 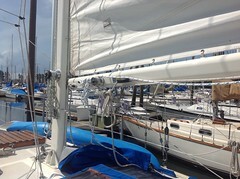 Such is the funny things and no so funny things we see, and cruising life in a sunny California harbor!